FACT: The mammoth’s tusks grow throughout life of the mammoth. By counting the growth rings at the thickest point, one can find out how old the mammoth was. They grew about 10 to 20 cm each year. The woolly mammoth (Mammuthus primigenius) is an extinct species of mammoththat lived during the Pleistocene epoch, and was one of the last in a line of mammoth species, beginning with Mammuthus subplanifrons in the early Pliocene. The woolly mammoth diverged from the steppe mammoth about 400,000 years ago in East Asia. Its closest extant relative is the Asian elephant. The appearance and behaviour of this species are among the best studied of any prehistoric animal because of the discovery of frozen carcasses in Siberia and Alaska, as well as skeletons, teeth, stomach contents, dung, and depiction from life in prehistoric cave paintings. Mammoth remains had long been known in Asia before they became known to Europeans in the 17th century. The origin of these remains was long a matter of debate, and often explained as being remains of legendary creatures. The mammoth was identified as an extinct species of elephant by Georges Cuvier in 1796. The woolly mammoth was roughly the same size as modern African elephants. Males reached shoulder heights between 2.7 and 3.4 m (8.9 and 11.2 ft) and weighed up to 6 metric tons (6.6 short tons). Females reached 2.6–2.9 m (8.5–9.5 ft) in shoulder heights and weighed up to 4 metric tons (4.4 short tons). A newborn calf weighed about 90 kilograms (200 lb). The woolly mammoth was well adapted to the cold environment during the last ice age. It was covered in fur, with an outer covering of long guard hairs and a shorter undercoat. The colour of the coat varied from dark to light. The ears and tail were short to minimise frostbite and heat loss. It had long, curved tusks and four molars, which were replaced six times during the lifetime of an individual. Its behaviour was similar to that of modern elephants, and it used its tusks and trunk for manipulating objects, fighting, and foraging. 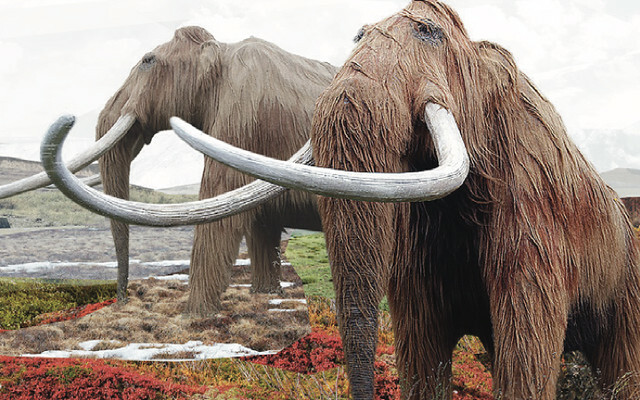 The diet of the woolly mammoth was mainly grass and sedges. Individuals could probably reach the age of 60. Its habitat was the mammoth steppe, which stretched across northern Eurasia and North America. The woolly mammoth coexisted with early humans, who used its bones and tusks for making art, tools, and dwellings, and the species was also hunted for food. It disappeared from its mainland range at the end of the Pleistocene 10,000 years ago, most likely through climate change and consequent shrinkage of its habitat, hunting by humans, or a combination of the two. Isolated populations survived on St. Paul Islanduntil 5,600 years ago and on Wrangel Island until 4,000 years ago. After its extinction, humans continued using its ivory as a raw material, a tradition that continues today. It has been proposed the species could be recreated through various means, but none of these are yet feasible.